Heat kitchen appliance to 350 degrees F.
munificently grease a 10-inch springform pan with butter. For cracker crust, crush graham fruity in kitchen appliance till consistency of bread crumbs; stir with fusible butter till mixture holds form once squeezed. If needed, add a bit a lot of fusible butter. Firmly press cracker “crust” into bottom and on bottom sides of spring type pan; put aside. Sift along flour and sugar in tiny bowl. In medium bowl, stir along cheese cheese and orange peel. Slowly fold in flour mixture with spatula till well amalgamated and sleek. Add eggs, one at a time, continued to mix with spatula. Stir in seasoner. Pour batter into spring type pan and gently sleek prime with spatula. Bake for 55-60 minutes at 350 till cake is firm all the thanks to prime center. Cool fully and refrigerate for 2-3 hours to line. dirt prime of cake with granulated sugar. 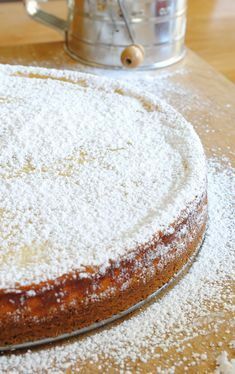 0 Response to "Sicilian Ricotta Cheese Cake"